About 3 years ago, my mom came home from a ski trip out in Colorado with this magical recipe for pancakes. They were perfectly dense, buttery and by far some of the best pancakes I had ever had. Unfortunately, the recipe called for lots and lots of butter, white flour and buttermilk. I think it is absolutely fine to have them in their original form on occasion, but since I have such a serious pancake habit, I needed to figure out a healthier way to enjoy them. 1. In a bowl whisk together the Greek yogurt and water until smooth and evenly combined (sort of like a thin buttermilk). 2. Measure out 3/4 cup of the yogurt mixture and soak the oats in a separate bowl for 5-10 minutes. 3. In a larger bowl whisk together the flour, baking soda, baking powder, nutmeg and cinnamon. 4. Now gently stir in the oat mixture, remaining yogurt mixture, egg, coconut oil and maple syrup into the dry ingredients. Mix just until combined and let sit for 5 minutes. 5. Lightly grease (I used coconut oil) a skillet over medium to medium-high heat. For each pancake pour 1/4 – 1/3 cup batter (depending on how big you want your pancake) onto the skillet and wait until air bubbles start to develop on the surface before you flip it. 6. 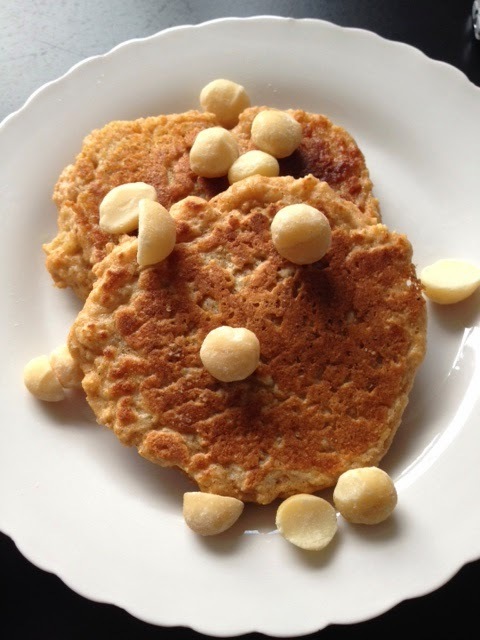 Plate pancakes and garnish with some whole macadamia nuts and whipped cream if you’re feeling fancy! Looking for something a little lighter…possibly a tad greener? Well I think my Tropical Green Smoothie should do the trick! Directions: 1. 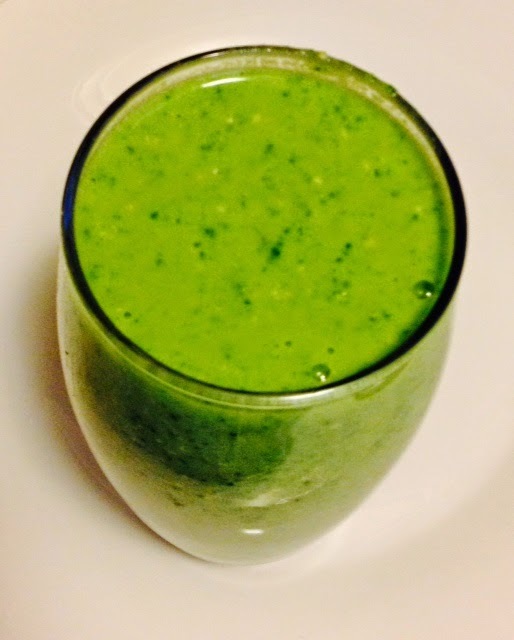 If your blender is anything like mine, you’re better off blending the spinach and water first (on high) and then adding in the remaining ingredients. Blend until completely smooth. 2. Enjoy immediately or refrigerate for later!